Regiment/Catrawd: Military Police Corps Military Mounted Police attd. IX Corps. Ref No Grave or Memorial / Rhif cyfeirnod bedd: IX. C. 16. Died from Influenza on April 2nd 1919 with Army on the Rhine. 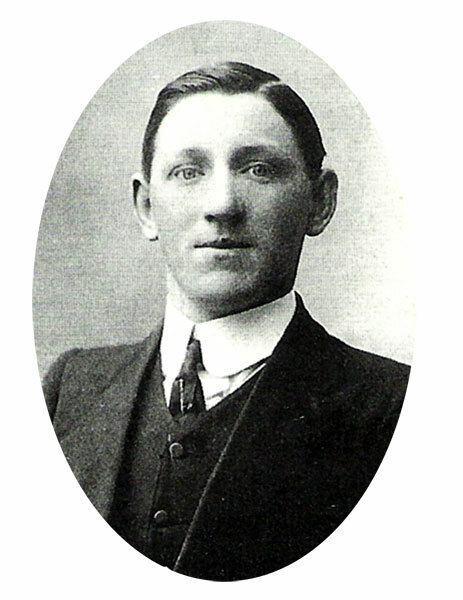 Harold William Davies – sometimes referred to as Harold and sometimes as William. This soldier was born in Penley and served as a Police Officer in Shotton before the war. He is named on memorials in Penley and Shotton/Connah’s Quay. Harold’s father John had been widowed in 1884, losing his first wife Hannah. He was remarried in 1887 to Emma Darlington at Wem. (Wem Vol 6a Page 1363). The family was recorded in the census of 1891 living at “Blackwood”, Burgess Lane, Penley, Ellesmere. Head of the household, John Davies was 39, a Farmer who had been born in Bradenheath, Salop. His new wife, Emma was 28. she had been born Quina Brook, Salop. Listed were two of John’s children from his first marriage. Sarah Ann was 19 and Winifred was 15. John & Emma’s own two children, Albert,2 and John D 1, had both been born at Penley. Emma’s brother, John Darlington was in the household for the census. He was 19 and a Butcher. There were two male domestic general servants. By 1901 the family was still living at “Blackwood” but Emma was by then a widow and described as a farmer. Her listed children in the household were Albert, 12, John D, 11 and Harold 9, who had all been born at Penley. There were 2 resident servants, Thomas Jones, was a Stockman (Cattle). Elizabeth Wolley,was a Domestic Servant. The 1911 census records that Harold then aged 19 was living with his cousin at Little Green, Penley, Ellesmere in a large house of 12 rooms. Head of the household was Frederick Owen, 28, a Farmer.His wife of 8 years was Mary Lizzie aged 26. She had given birth to 6 children, 2 of whom had died. Harold, was described as a Cousin, who was “Working on the Farm.” There were 4 Owen sons, Eferton, 7, Hubert, 5, Harold, 4 and Godfrey 2. There was also 1 servant, Annie Gittens, 17. At some point after this, he joined the Police Force. UK, Soldiers who Died in the Great War, 1914-1919, accessible on www.ancestry.co.uk confirms the regimental details as above and adds that he was born in Penley and he resided and enlisted in Shotton. Harold William Davies’s Army Service Records have survived and are accessible on www.ancestry.co.uk They tell us much of his military story. His Attestation papers show that he enlisted on the 10th December 1915. He gave his address as the Police Station, Shotton. He was 24 years and one month old and was a serving Police Constable. He declared previous military experience in the Shropshire Yeomanry. He named his brother John D Davies of Salop Road, Overton on Dee as his next of Kin. He was a reservist from 11th December 1915, mobilised and posted on the 1st January 1916 and appointed Lance Corporal on the same day. His religion was C of E.
He was approved and appointed to The Military Mounted Police on the 8th January 1916. Aldershot. There is a casualty form in the records that gives us some indication of his movements in the military. He embarked from Southampton on the 14th April 1916 and disembarked at Rouen and joined his battalion the following day. He was admitted to no 8 General Hospital on the 14th May 1916 but it’s very difficult to decipher why. He was discharged back to duty on the 4th June 1916. He was posted to the 9th Corps ‘in the field’ on the 20th June 1916. He had leave to return to the UK from the 4th September 1918 until the 18th September 1918 via Boulogne. He was admitted ‘in the field, with influenza on the 26th March 1919 and he died of influenza on the 2nd April 1919. His records include a Medical History. The form states that he was examined on the 3rd December at Shotton. His age as 24 years and 20 days. He was a Police Constable who was 5 feet 11 inches tall and weighed 184 lbs. His chest measured 37 1/2 inches with an expansion range of 1 1/2 inches. His physical development was deemed to be excellent and his vision good. He had an abdominal scar following an appendectomy. He was approved for general service and joined the Mounted Military Police as P2934. He “became non effective” from influenza and pneumonia whilst serving with the British Expeditionary Force in France on the 2nd April 1919. There are a number of telegrams in the records. Some were internal army memos reporting Harold William’s death. There was also one to his next of kin, brother John, informing him of the death. There was correspondence about medals, commemorative plaque and scroll and moneys owed to John. There was information about his personal effects which were to go to John. This list is a poignant one. “Photos, Note Book, 2 razors in cases. Electric torch, 2 purses, 8 chevrons, metal rule, black cat, safety razor, watch, 35 coins, dictionary, 2 knives, fountain pen, 4 lighters, 2 whistles (1 with chain), locket with views, 2 cigarette cases, matchbox holder, keys, metal ring, cap badge”. COUNTY HERALD – 18th April 1919 – SHOTTON – Local Constable’s Demise. – News has recently been received in the district that Corporal Harold DAVIES has recently died from pneumonia in hospital “somewhere near the Rhine.” Corporal DAVIES will be remembered as the local police constable in the Shotton district. He was a single young man, only 26 years of age. Previous to enlisting in H.M. Forces, he resided in King Edward Street, Shotton, and was stationed in the Shotton district for just over a year. He joined the army in 1915, and was with the army of occupation at the time of his death. He had been in France for over two years in the Military Police. There is an index card for Harold in The Flintshire Roll of Honour at The County Record Office in Hawarden. Card (Penley F 4) It gives the address “At his brother’s Salop Road, Overton.” His period of service was 3 years 4 months and he was a Corporal in France for 3 years. This source reports that he died from Influenza on April 2nd 1919 with the Army on the Rhine. The card was signed by John D. Davies, December 10th. (Probably 1919). Harold left a will. The England & Wales, National Probate Calendar (Index of Wills and Administrations), 1858-1966 includes an entry for him. Davies Harold William of the Police Station Shotton, Flintshire, Lance-Corporal No. P. 2934 Military Mounted Police died 2nd April 1919 in France on active Military Service. Administration (With Will) St. Asaph. 4th November to John Darlington Davies, Butcher. Effects £742 17s 6d. Harold William Davies in the UK, Army Registers of Soldiers’ Effects, 1901-1929 – Harold’s brother, John D. Davies was the sole Legatee. 3 Policemen of the 14 Officers named were local to us, one being Harold William Davies. Germany, plot IX. C. 16. 1916. Buried at the Brandhoek Military Cemetery, Belgium, plot II. F.
Harold's Grave in Cologne Southern Cemetery. Many thanks to William Harold's great niece, June Davies who allowed us to use the photographs on this page from her family tree on Ancestry.